He’s been the art director of a National Award-winning film, was a student of K.G. 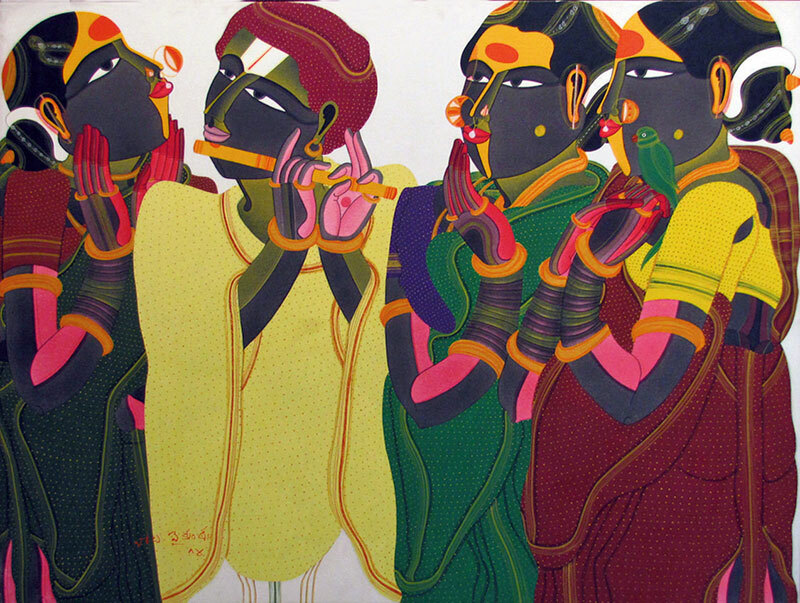 Subramanyan — a pioneer of Indian modern art — and has taken his canvases to Germany, USA and UK. Thota Vaikuntam, whose career spans over 40 years, returns to London with a solo exhibition after a decade. In association with New Delhi’s Art Alive Gallery, the artist will take several of his recent artworks to the British capital. “For me, it was always the people of my native Telangana who have been my inspiration. Everything was here — intimacy and universality, colours and form. I never had to look elsewhere for inspiration; it was always all around me,” says Vaikuntam about his muses. From their giant bindis to colourful saris, the creator has brought the distinctive features of Indian women around him onto canvas, blurring the lines between folk and high art. “My early years as an artist were full of struggle. It was difficult to make people understand that art was a passion as well as a career. You had only your talent to back you up. Perseverance was important. Today, art is composed of many things. The struggle is still there, but younger artists do not have to languish — they can reach out to art lovers more efficiently,” he says about the changing art scene in the country. Thota Vaikuntam’s solo show will be on display at Grosvenor Gallery, London, from September 24 to October 10, 2015.